Campsite Les Peupliers is a campsite in Canet-Plage, Pyrénées-Orientales, located by the sea.The campsite has which are marked out and pitches with shade. Camping Les Peupliers is located close to a sandy beach. It is possible to rent tents, mobile homes and bungalows. The campsite has a sports ground. The camp site has an outdoor swimming pool and a toddlers' pool. There is also water slide. You can swim nearby in the sea. 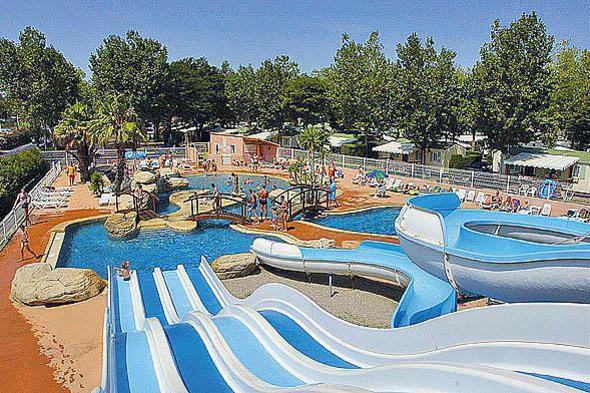 "Quiet family campsite with deciduous trees that provide shade and a playful swimming pool with slides, located within walking distance of the sea (500 metres). It is a 5-minute walk to the marina and the centre of Canet-Plage can be reached by ferry." From A9 take exit 41 Perpignan-Centre. Direction Le Barcarès/Canet-en-Roussillon via D83 and D81. In Canet, at 1st roundabout, follow signs for Ste Marie and then Zone Technique du Port and campsite signs.